What If Analysis (Multiple Scenarios Manager) for Excel can quickly and simply create, evaluate and manage multiple what if scenarios within Excel analytical models. Excel What If Analysis allows to visualize how the impact of changes in the values of input variables affect the output variable values. 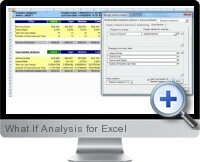 The what if analysis scenarios can be selected easily without changing the original underlying Excel model. Furthermore, Excel What If Analysis allows to model scenario changes in the input variables in order for the output values to equate to a desired value. This functionality works in a similar way to the native Excel Goal Seek but with more power and flexibility. Excel What If Analysis is fully integrated into Excel so that scenario analysis can be executed quickly and easily without leaving the application.